The study has empirically examined factors affecting Money Supply in Bangladesh using annual time series data from 1975-6 to 2008-09. Authors observed that high-powered money played a dominant role in the money supply process of Bangladesh, thus providing partial support for the monetarist hypothesis. However, beyond the monetarist view, additional variables in the light of the Keynesian and structuralist analysis, such as the availability of external resources and financial liberalization need to be taken into account in understanding the money supply process of the country. But some other structural variables such as government budget deficits, deposit interest rate, and bank branches were not found to be significant in explaining money supply function. However, the observed insignificance of these variables could be attributable to multicollinearity problem in the data and needed to be interpreted with caution. Since the presence of multicollinearity is not a serious problem in forecasting, it was also found that the estimated money supply models could be quite useful in forecasting money supply in Bangladesh. Moreover, the forecasting power of the estimated M1R and M2R models are also examined in this paper. Recruitment is an essential tool of HR for sustaining the required number of employees based on operation for the organization it serves. This process can be used to build a corporate image to make it more attractive to the job seekers as well as other stake holders. This paper seeks to highlight the current practice of recruitment advertising in the context of Bangladesh through newspapers. In this research it has been found that very few companies concerned regarding the attractiveness of their advertisement. Some of the companies provide thought provoking information of the content analysis of selected newspapers for a given period resurfaces some interesting findings including the basic research questions. Tobacco use, which is rising quickly in developing countries, kills 5.4 million people a year worldwide. This paper explores the impacts of smoking habit by young generation in our society. Using 180 primary data from different public and private university students of Bangladesh, the analysis finds that smoking is associated with poor overall health and a variety of short-term adverse health effects among young people and may also be a marker for underlying mental health problems, such as depression among adolescents. The habit of smoking is largely seen among young generation because of lack of the awareness & proper education. There are some other causes like- peer pressures; attractive advertising, desire to look mature etc. & also some biological factors encourage young people to smoke. Secure property right is a necessary condition for economic prosperity of a country. It affects an economy in various ways one of which is the international trade. Country with high risk of right infringement cannot attract entrepreneurs to invest in that economy. The resulting decline in production hampers international trade. Lax enforcement of rights can ensue from various different sources including lack of sufficient rules and laws and also court’s view in explaining these laws. The paper first, describes laws regulating intellectual property rights in Bangladesh and then analyses cases to show judicial interpretation of some laws. It then compares between South Korea and Bangladesh in respect of these two elements to figure out what is lacking in Bangladesh in protecting property rights. The paper finds that Bangladesh is lagging far behind than South Korea in terms of providing sufficient infrastructure to protect property rights. However, courts’ view on the scope of some intellectual property rights is similar to a great extent in both countries, which helps to conclude that Bangladesh should concentrate on increasing infrastructure to reap the benefits of secure property rights. The readymade garments (RMG) sector of Bangladesh has been maintaining its impressive growth rate for quite a long time. But although there have been many studies on this sector, significant analysis of the trends in the growth rate of the garments sector is yet to be done. Moreover, a formal statistical measurement of how the recent financial crisis would affect the garments exports has not been done yet, which is surely very important for policy making, given the current economic situation of the world. Using non-parametric approaches and time series econometrics, this paper provides a first look at the trend growth rates of RMG exports, and provides a special focus on RMG exports of Bangladesh in the US market, since USA is the largest buyer of RMG products (if individual countries are taken into account). The main conclusion is that the trend growth rates of both the total RMG exports to all countries and the RMG exports to USA are showing signs of decline. However, application of ARIMA estimation and co-integration techniques show that in the US market, the RMG exports would show some increase in the coming year, even after accounting for the recent financial downturn. This means that the future of the RMG export earnings from USA might not be as disastrous as speculated by many. Since economic fluctuations in USA tend to affect the rest of the world significantly, this indicates that there is a probability that RMG export earnings from other countries would not decrease as well. But precise country studies like the one presented in this paper are needed to reach such a conclusion about the other countries of the world. In recent years an interesting claim has been widely discussed by various researchers and academics that there has been a striking growth of knowledge based economy. The claim continues towards organizational level, where the concentration is given on the emergence of a knowledge based organizational management, and whether this knowledge can be integrated with the organizational talent acquisition (recruitment and selection) process. By aligning knowledge management with the traditional talent acquisition process, how firms can achieve competitive advantage in perspective of the modern, rapidly changing and competitive and dynamic business environment is now a foremost human resource management issue. Talent acquisition is a fundamental activity of Human Resource Management (HRM), whereas, managing knowledge and creating a knowledge based culture in organization is a new concept. This article verifies these claims by critically analyzing some statistical data and researches conducted by academicians and industry top thinkers. The aim of this paper is to examine the linkages Corporate Characteristics, Governance Attributes and the Extent of Voluntary Disclosure in the annual reports of listed companies of Bangladesh. The paper is based on a sample of 120 listed non-financial companies in Dhaka Stock Exchanges (DSE) 2007. The study is used ordinary least squares regression model to examine the relationship between explanatory variables and voluntary disclosure. Using an unweighted relative disclosure index for measuring voluntary disclosure, the empirical results indicate that a positive association between board size and voluntary disclosure, board leadership structure and voluntary disclosure and between board audit committee and voluntary disclosure. In contrast, the extent of voluntary disclosure is negatively related to proportion of INDs, ownership structure and net profitability. 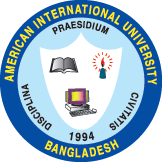 This paper explores university-industry knowledge transfer channel used by the faculty members of American International University-Bangladesh (AIUB). We perform a case study of the faculty members of AIUB, aimed at gaining insight in the relative frequency and perceived importance of different channels of knowledge transfer. The empirical material is based on a survey among faculty members in all disciplines through a questionnaire. We use factor analysis and cluster analysis to arrive at the taxonomy of using knowledge transfer channels. The taxonomy distinguishes three types of respondents, and we employ logistic regression analysis to relate the types to respondents’ characteristics. It is found that the three groups differ on relative frequency and perceived importance of using different channels in terms characteristics, experience, position, and involvement. On the basis of our findings, we draw a number of policy implications for the university, among others that policy measures are not likely to be effective if they do not include a multitude of incentives, a wide range of channels, and institutionalization of research through cooperative arrangement with industry involving researchers of the university.